mr.h is proud and honoured to be the selected design agency for the ministry of cabinet affairs, the prime ministers office, UAE. dubai is a fast moving city and with his hignesses vision of a digital city our approach was always to look the future but not forget the past. the prime minister’s office launched an international and a local competition to promote the usage of drones to assist in our everyday lives. mr.h was appointed to create the brand for this, as well as designing the overall look and feel of the website. the website design had a feeling of movement using a parallax effect combined with a iconic bar pictogram. the website featured a cms media area for up to date reports on the competition as well as a members log in section to up load you tube videos of their projects. the government summit, titled "leading government services", and held in february, under the patronage of His Highness Sheikh Mohammed Bin Rashid Al Maktoum, UAE Vice President, Prime Minister and Ruler of Dubai, is an annual platform aiming at leading government services by discussing ways to develop new concepts for delivering quality government services to make governments more efficient in addition to deliberating enhancing citizen happiness through transformative government services. mr.h worked with the communications team to design and produce a report of the event in the style of a coffee table book, in english and arabic. the book highlighted the major speakers and developments at the show. Sheikh Mohammed bin Rashid Al Maktoum, ruler of Dubai and vice president and prime minister of the UAE, the established the Emirates Excellence Council in order to foster a “national culture that encourages all to achieve excellence” in the Gulf state. The council will see all of the UAE’s existing local and federal excellence programmes brought under one umbrella. Sheikh Mohammed said that the organisation will help bolster government excellence in all sectors, create new opportunities and bolster the status of the UAE globally. 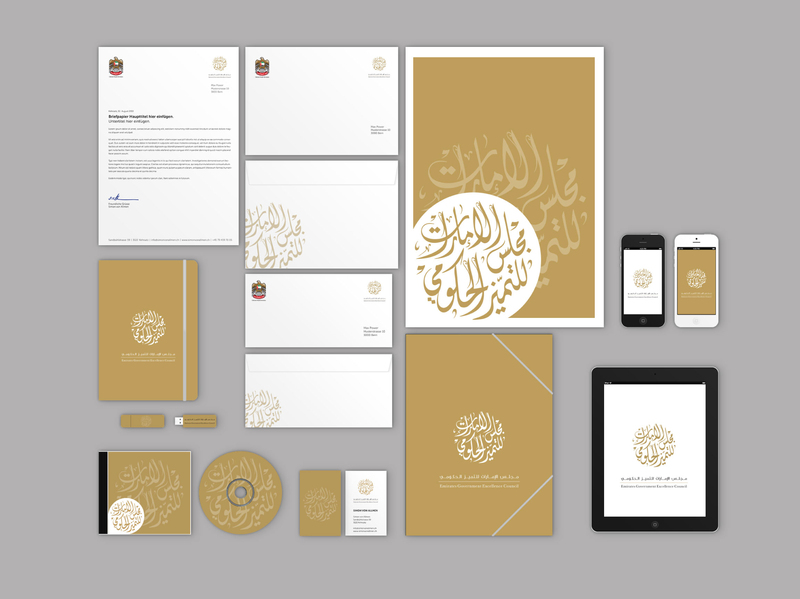 the mr.h team used the art of arabic calligraphy to create a the brand for the initiative and with this is mind a complete set of brand collaterall, including letterheads, business cards, envelopes etc. for this prestigeous event.